Here's the drawing of our bedtime desires -- sheets that fit! Dreaming of South Seas adventures in exotic foreign countries, wondering if your dreams will ever come true? Ours is shaped like a slice of pie, with our four feet battling – err – cuddling in a space well less two feet.Still, it's far bed-der than it used to be! Click here to find out why. The widest part of our bed is about queen sized, though often “deep pocket” fitted sheets won't cover it. It's not exactly well suited to “off-the-shelf” sheets. 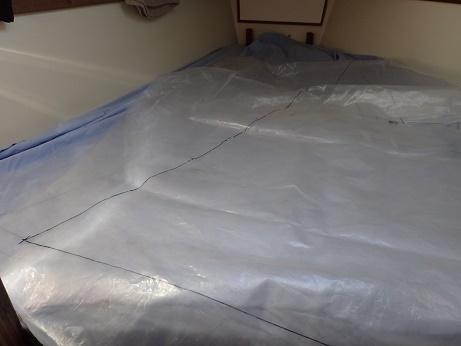 Most nights, our fitted bottom sheet pops off, bunching up and leaving a stretch of our mattress bare. As I don't sew, getting custom sheets has been on my to-do list for a long time. When I did get around to looking into it, there were always so many other expenses, I balked at the price. Finally, after nearly three years, the time arrived to do something about it. The last straw was the tears along second stretch of duct tape on the one fitted sheet that usually stayed. A friend offered to sew the tears, but it was clear to us the fabric was simple disintegrating. 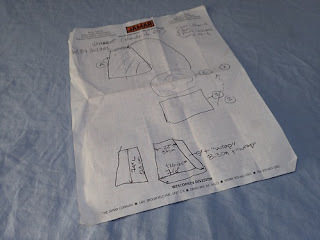 Our friend Patty of Armagh loaned me her boating sewing project book, which advised a template. Wayne drew one up with me on clear plastic, based on the measurements we took of our bed. The measurements were recorded on a drawing, in both inches and metric. The pattern of our desires. Unused and in this case, unfulfilled. I brought our template, the drawings and some fabric to the Pape'ete,Tahiti to a couple fabric shops, figuring they either offered those services or knew customers they could recommend for the work. After much waiting, they suggested checking with vendors in the adjacent open air marketplace. Eventually, one of the vendors said “Maybe.” She took my drawing and fabric, after telling me how much more to get and where. She was not interested in the template, but promised to get back to me if her mother-in-in-law agreed to take on the project. As is nearly always the case, the project straddled a holiday weekend; which there are no shortage of in French territories. Tuesday rolled around and with great hope, I returned to the marketplace to collect the finished sheets. I never even got a quote. I just didn't care anymore. In the interim, I found a stretchy fitted queen-sized jersey cotton sheet for about $12 and bought it to get us by for a few days. Amazingly, it fit! “Maybe” became “No,” but she connected me with another vendor whose sister-in-law would take on the project. Final result? The darker blue is the custom-sewn fitted sheet. Oops! “Your bed is really small!” exclaimed the vendor, whose sister-in-law eventually showed up with the sheets. I agreed, paid, and headed back to the boat, sheets in tow. The top sheets were perfect. The bottom sheets? Not even close. Miniscule. For about $170 in extra fabric and labor, we have a great supply of rags. I bought two more of those $12 cotton jersey fitted sheets. 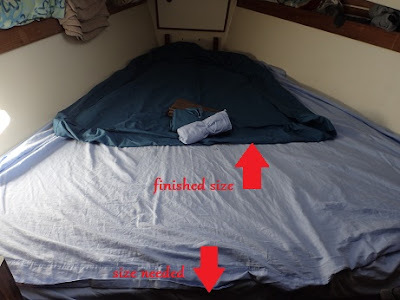 Is it any wonder while you may fantasize about sailing the South Seas, our latest shared fantasy is about clean white sheets that fit, in a bed with more than 2 1/2 of headroom if we are not laying down? Yeah, we have it tough. Mo'orea, French Polynesia. Moody and beautiful. There are worse places to be "stuck." We are in beautiful Cook's Bay Mo'orea, French Polynesia (S17.30.310 W149.49.207). As our French Polynesia visa is the standard 90 day visa, ours will run out July 21st. We're head out tonight, hopefully (we've been delayed due to being a bit under the weather) for an overnight sail to Huahine, then finish in nearby Bora Bora before we leave French Polynesia. After that we're off to American Samoa with a rest stop at Suwarrow, Cook Islands along the way, weather permitting. Please excuse these less than stellar photos. My Macintosh is dead; this is created using Wayne's PC laptop with minimal image editing software (no iPhoto images). The plan is to replace my Mac when we get to American Samoa. That will likely be early August. Still taking photos and on our adventures so watch for lots of catch up stories and images (and eventually, video -- lots of short clips)!